Ahmednagar, Apr 13: Seeking to make the Lok Sabha polls a contest between him and Congress chief Rahul Gandhi, Prime Minister Narendra Modi asked voters to choose between "imaandar (honest) chowkidar' and 'bhrashtachari (corrupt) naamdar". Gandhi has been hurling the "chowkidar chor hai" jibe at Modi to claim irregularities in Rafale deal, while the PM has been calling the Congress chief as 'naamdar' (dynast). "You have to choose between imaandar chowkidar and bhrashtachari naamdar. You also have to choose between heroes of India and supporters of Pakistan," Modi said. 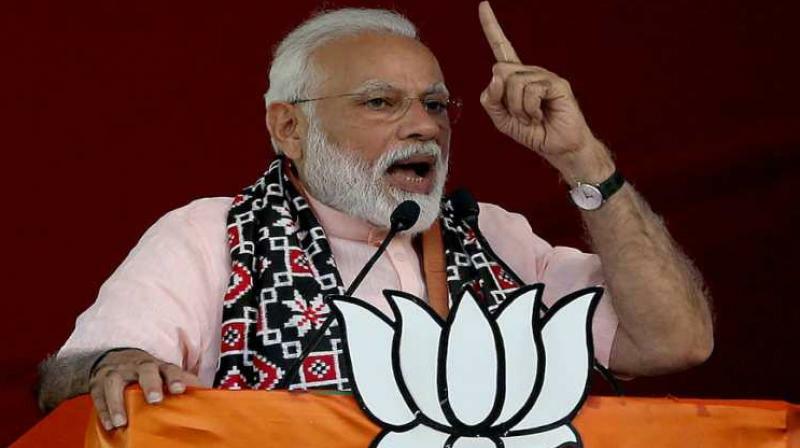 At a rally here to campaign for BJP-Shiv Sena alliance candidates of Ahmednagar and Shirdi Lok Sabha constituencies, Modi said, "You have to decide the country's future and which direction will it take in this election." Modi said in the last five years, people have seen that his government is a strong regime which takes decisions. "You have seen Chowkidar's government which is strong and takes decisions. Scams and decision-making delays were the order of the day during the remote-controlled government (UPA) earlier," Modi said. "During the UPA rule, bomb blasts were frequent in which farmers, middle class people and traders were killed. Blasts happened in trains, buses and stations. But under the Chowkidar's rule, where are the bomb blasts," he said. "This is because the Chowkidar has instilled fear in minds of the terror perpetrators that even a single mistake would prove costly for them. The Chowkidar will find them from hell and punish them," Modi said. Modi asked if people agree with his policy of killing terrorists by going into their territory and killing them. He said the earlier government looked weak "in front of Pakistan and rest of the world". "Our army wanted to take revenge but the (then) government kept quiet. This Chowkidar gave permission (to army) to kill terrorists by going inside their territory. Are you happy with this strong government," he said. On the National Conference demanding Prime Minister's post for Jammu and Kashmir, Modi said, "the Congress and NCP are supporting those who demand that Jammu and Kashmir have a Prime Minister." "I have no expectation from the Congress since it has stopped thinking about people long ago," he said. "This sin is the creation of that party," he added. Modi said NCP chief Sharad Pawar had quit the Congress in the name of the country. "Sharad rao, how can you be silent on the two PM demand. Why are you silent? Is this acceptable to you? "Your party's name is Rashtravadi but you see the country through a foreign lens after allying with the Congress again. Is the name Rashtravadi in your party to fool people," Modi said. Reaching out to first-time voters, Modi said,"those born in the 21st century will be voting for the first time. Do you agree with the weak approach of previous governments and their compromising national security? Is this acceptable to you?" Modi said he has been able to work on various development projects, including farmers welfare, because of people's support. 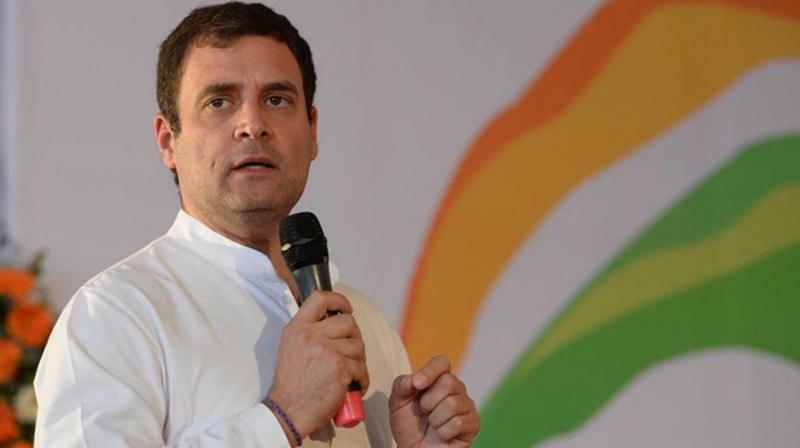 He expressed confidence that the "Modi sarkar" will be re-elected on May 23 when results of the ongoing Lok Sabha polls are declared. Modi said after being re-elected to power, his government would have a separate ministry for water management. He accused the Congress-NCP combine of being enemies of farmers. Modi said the Congress needs to be decisively defeated to ensure poverty eradication, modern infrastructure and development of all sections of society. Continuing his tirade against Rahul Gandhi, Modi linked the IT raids on aides of Madhya Pradesh Chief Minister Kamal Nath, claiming this was "Tughlak Road chunavi ghotala" (election scam). Tughlak Road is the residence of a "naamdar neta" in Delhi where funds are being sent, Modi said. "Child nutrition funds given to Madhya Pradesh government are being used for elections. Habits of the Congress won't go. The Chowkidar is alert and that is why he could arrest the thieves," he said. Notably, Madhya Pradesh Chief Minister Kamal Nath's residence as an MP is at 1, Tughlaq Road in New Delhi, while Congress president Rahul Gandhi's official residence as an MP is 12, Tughlak Lane in the national capital. The Income Tax Department recently conducted raids on close aides of Madhya Pradesh Chief Minister and Congress leader Kamal Nath and others in four states on Sunday.